So, remember my Mango Avocado Salsa from a couple of days ago? And remember when I told you that fish tacos were in the works? Well, taa-daaah! 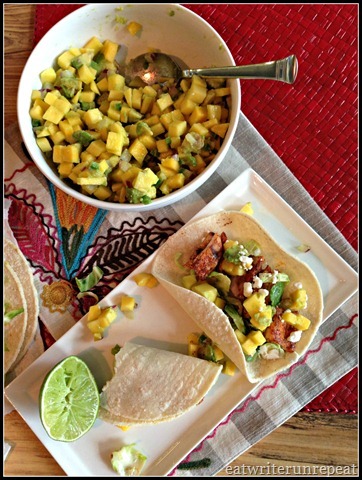 I have to be honest, as soon as I made mango avocado salsa I knew I wanted to make fish tacos to go with it. I don’t know where the obsession with fish tacos came from, but I’ve had a serious craving for them lately. Oh, wait I remember. It was probably the blackened swordfish taco I had at Yard House restaurant in California. To. Die. For. Sadly, mine weren’t near as good as those, but they weren’t half bad if I do say so myself! Plus, with only four ingredients, I whipped these up in no time. And although I had to turn on my stovetop for the fish, I pan fried the mahi mahi pieces and it literally took about six minutes total. It was barely enough time for my kitchen to heat up. And speaking of the mahi mahi pieces: um, how awesome is Trader Joe’s that they actually have a bag of mahi mahi pieces that are absolutely perfect for fish tacos?! I just seasoned the fish with some cajun seasoning and let it sit for a few minutes, tossed it into a hot pan with coconut oil, fried them up and done! Perfect! Once the fish was done, I served it up on a corn tortilla with some mango avocado salsa, a spritz of lime, and … shredded brussels sprouts. Ok, ok, there’s a story here. I had a bag of Trader Joe’s shredded brussels sprouts in my fridge, but no cabbage. And fish tacos don’t taste the same without cabbage, so I improvised. As long as you use the shredded leaves and not the thick inner part of the sprout, it totally worked! Still – next time I’ll just stick to regular old cabbage. Oh and of course I served these with beer. Duh. By the way, if you’ve never tried Goose Island 312 Urban Wheat Ale then you’ve never lived. It’s awesome – not too heavy for a wheat ale, it still has a refreshing crispness that went really well with the spicy fish. Yum. 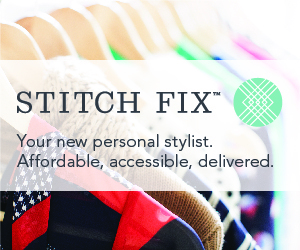 Go get some, like right now! The only thing I couldn’t really get right on this was the tortillas. I tried to heat them directly on my gas range, but that didn’t really work, they still dried out. Then I put some on a plate, covered them with a damn paper towel and saran wrap and microwaved them, but nope. They still cracked when I attempted to eat my tacos…so I may or may not have eaten them with a fork and in pieces. If anybody has a great tip for keeping corn tortillas soft, I’m all ears! 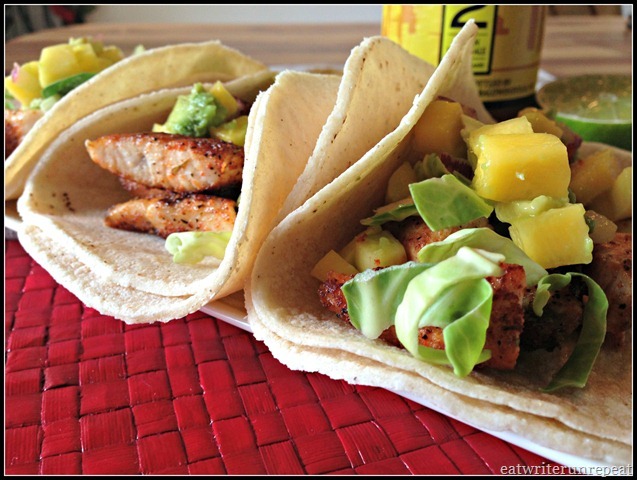 You could use any firm white fish you wanted for these tacos, but I prefer either mahi mahi or swordfish because I think they have the best flavor and hold up well. Plus, you’ve already heard my awesome Trader Joe’s mahi mahi story. Heck, if you wanted to get really crazy you could try them with salmon or maybe even scallops! Ooh. 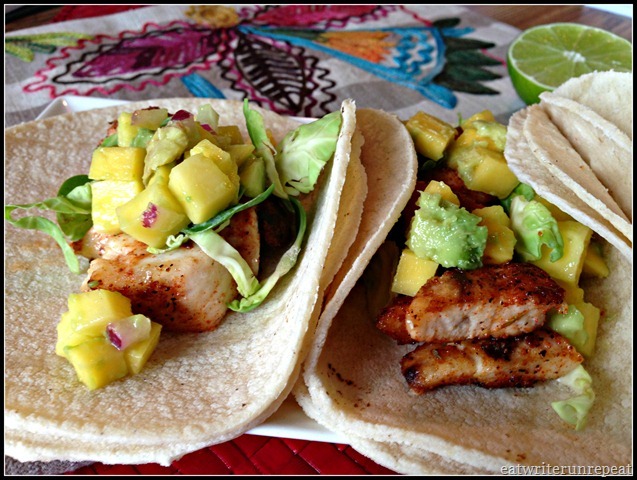 Scallop tacos with mango avocado salsa? Woah. Sprinkle your fish with the cajun or blackened seasoning and let sit. In a pan, melt approximately 2 tbsp of coconut oil and add the fish, cooking about 3 minutes each side or until cooked through. Drain if necessary or desired. 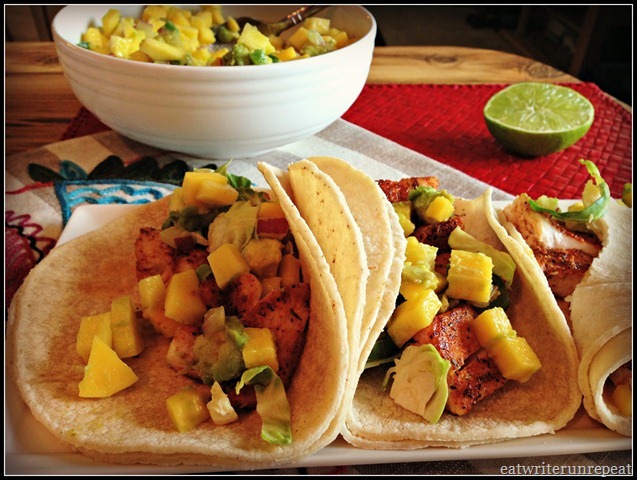 Top your corn tortillas with fish, mango salsa, and cabbage. Add a spritz of fresh lime juice and chow down! 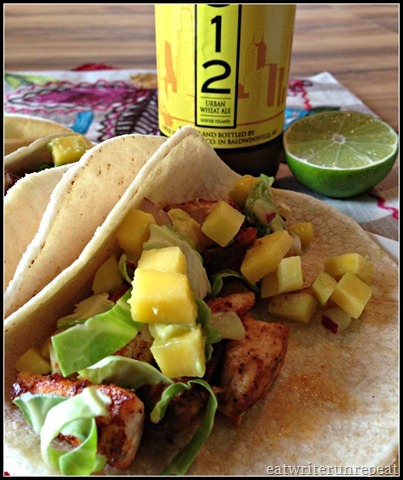 Posted on 23 July 2013 1 October 2015 by BeePosted in Booze, Dinner, SeafoodTagged beer, cajun seasoning, dinner, fish tacos, mahi mahi, mango, salsa.